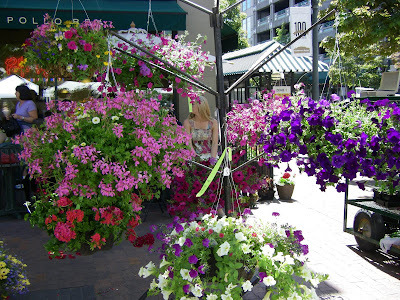 Last weekend I was in Boise, Idaho and a good friend of mine, another PR professional and blogger-extraordinaire, had asked if I would be a "guest writer" on her blog and talk about all the things I did and places I visited while in the Treasure Valley ~ I've pulled some exerpts that are more relevant to this site, and list a variety of restaurants where Celiacs can find a safe and enjoyable meal. So perhaps the next time one of you stop by Boise for a visit, try out one of these delicious eateries and cheers to you! I’ve been visiting Boise for many years now, and the more I visit, the more I like the City and its abundant community activities and well-planned events – and I’m not just saying this because of my Basque ties. It’s very inspiring to me, an out-of-towner, to see how a relatively small city has created such vibrant and cultured diversity for its residents to enjoy, throughout every season. Restaurants abound throughout the downtown area of Boise and a few that we ate at over the weekend are worth mentioning. We grabbed a quick breakfast on Saturday morning at Satchel’s Grill and enjoyed their patio dining area before hitting the Capitol City Farmer’s Market which lines 8th Street with row after row of white event-type tents with vendors selling their wares and goods. 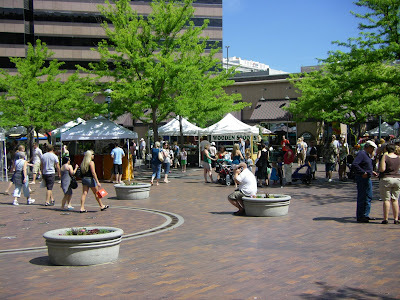 It’s a delightful market and on this particular Saturday the place was packed with sun-seekers out enjoying the day. One tasty highlight of the market was finding the Blue Bird Bakery with their gluten-free, dairy-free, soy-free delicious treats for sampling and for sale. Being a Celiac myself (www.glutenfreebowlofsoul.blogspot.com), I was thrilled to find this little upstart bakery offering some baked goods to those of us who can’t eat wheat/gluten. I was also happy to learn they will soon be selling their creations at the Boise Coop. Stay tuned. Speaking of gluten-free eating, another restaurant that I tried was The Grape Escape, an Italian wine bar and eatery in the Mode Building at 8th and Idaho Street with a European-style outdoor patio, providing front-row seats to all the fun people…people watching that takes place. Now, consider that I must order my meals totally gluten-free which can be tricky sometimes, and this time was no different. My meal was prepared incorrectly at first try despite my best-given instructions. The second time they got it correct and I must say that their garlic mashed potatoes could be the best I’ve ever tasted. They even comp’t my meal given the “re-do” and because of their consideration, I would definitely return for another meal, but this time armed with my dietary restriction card. 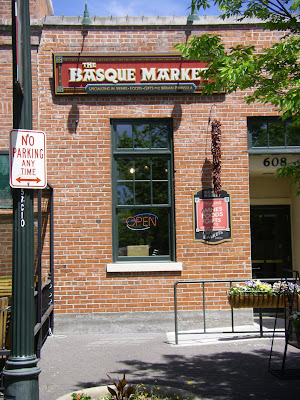 Now considering that I'm Basque, you might be wondering why I waited until now to mention one of my favorite parts of Boise, the Basque Block – like they say, “I was saving the best for last.” The Basque Block is quite an interesting and special location to visit, whether it’s representative of your culture or not. Surrounding the Block is the Basque Museum and Cultural Center which highlights many aspects of the history of the Basques people with changing exhibits that are great for kids to view, also. 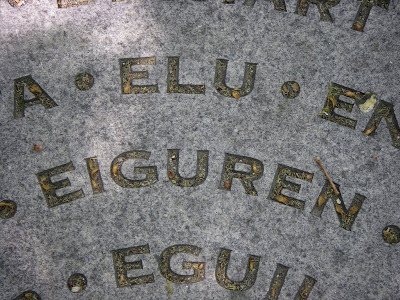 The sidewalks along the Block are equally intriguing with hundreds of Basque family names alphabetically stamped in concrete, along with some traditional songs imprinted on the sidewalk which are fun to try and read. Emphasis on try, due to the oh-so-complicated Basque language, Euskera. The Basque Market (owned by my cousins) is always a great place to visit and pick up the latest Tempranillo from Spain AND don’t miss their homemade rice pudding, just like Amuma used to make. On opposite ends of the Block are two of my favorite eateries in Boise – Bar Gernika, offering some great Sangria and the best Chorizos in the west, and Leku Ona, offering a more white-tablecloth dining experience upstairs and a traditional pintxo-style bar downstairs. Finally, there’s the mother of all “watering holes,” the Basque Center and Bar just kitty-corner to Leku Ona where the “true Bascos” hang their Chapalas and have a permanent bar stool with their name on it – a must see/must drink-at location!…Zorionak! Bonsoir au Les Bois for now, but you can bet I will be back very soon to enjoy more of this lovely Capitol City. For those suffering from celiac disease, there may be good news on the horizon. New research will discuss the latest advancements in the diagnosis and prevention of celiac sprue. Please click on the link below to read the article - this could be very good news! I am so appreciative of the wonderful comments I've received since posting my last entry regarding some of the safe restaurants I know of that offer gluten-free items. I thought it most-important to summarize all the great information that my lovely readers have sent my way. As Celiacs, we are ALWAYS searching for our "safe havens"...a.k.a. a restaurant we can enjoy that won't make us sick! For years the joy of socializing and eating out at restaurants with friends and family seemed so daunting to me and dangerous. I refused to give up that piece of my life, however. Though I do cook a large majority of my meals at home, I also have created a lovely collection of eating establishments that not only make my psyche happy and fulfilled, but my stomach too! For any of you starting the brave journey into the land of "is this a safe place to eat? "...I feel your anxiety, trust me. But don't give up on finding these unknown, hidden treasurers AND then sharing them with all of us! You see...I do believe that it's also up to ALL of us as Celiacs to go out there with dietary card in hand (if needed) and inform everyone in our worlds, our communities about what it means to live gluten-free and with abundance. If we all approach this journey as just that...a journey, not a goal or something to fix, we will have a much better chance at shifting perspectives and creating a much safer world for Celiacs all over the world. 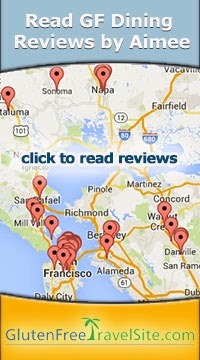 Keep up the great work and please continue to send me your restaurant finds, tips and information. Together, we can all truly make a difference and create the awareness that we so desperately need to instill in every restaurant server, chef and owner. In time this will happen, but it will take our diligence and time, especially in America. I'm still struck by the insanely higher level of awareness about Celiac Disease that almost every other country seems to posses. 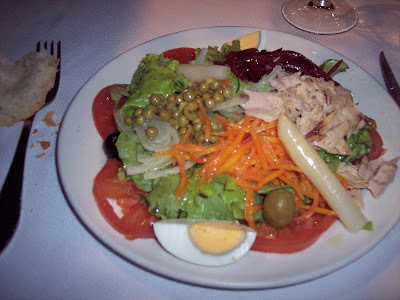 My last visit to the Basque Country in northern Spain last September, once again proved to me that our country is lacking in Celiac education. It didn't matter what tiny town I was visiting, or what bar I saddled up to for some tapas...EVERYONE knew about "Celiaca"...as they say, and how I could eat safely. I just love that. It's a gift and makes me want to live where they know how to feed me! Baja Fresh does not guarantee gluten-free dishes. They do not fry their chips or taco shells in separate fryers, so there is a huge possibility for cross contamination. Also, they do not switch gloves in between food preparation for each customer. So, please just eat there at your own risk, especially if you are a very sensitive Celiac! Each location does vary, so be very careful when ordering. I have successfully eaten their 'naked burrito' which is served in a bowl with no tortilla. Try these safe alternatives: Rubio's and/or Qdoba Mexican Grill. 3. I was told by several readers that Johnny Carinos, The Old Spaghetti Factory, and Carrabba's Italian Grill are great places for Celiacs to dine and the staff members/chefs are very educated and prepared at making gluten-free dishes. 4. Since it's BBQ season, Famous Dave's Barbeque has a list of sauces that are gluten free if requested. It is not posted on their regular menu and the list is a bit difficult to decipher. There are no guarantees that there isn't any cross contamination though, as far as prep stations for the food. 5. 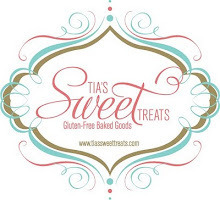 And finally...I was also told about another on-line company that have some delicious gluten-free goodies, breads, etc. so please visit and let me know what you think of Kinnikinnick.com. My best to you all - Let gluten-free abundance abound!! First, let me start off with the news of abundance - the kind that comes from the mere blooming of a gorgeous Orchid that I thought was loooong gone. 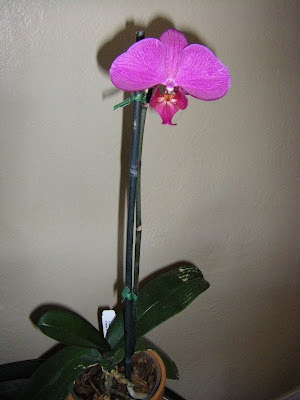 Almost two years ago, my beautiful friend Nere from the Basque Country in Spain bought this orchid for me as a birthday gift. The color was this magnificent fuchsia that took your breath away and it was as lovely as Nere. The blooms faded and died off, but for some reason I left that Orchid in my kitchen windowsill and would intermittently water it, always wondering if it might bloom again. Because it was a special gift from my dear friend, I couldn't bare the though of just chucking it in the garbage...so I waited and watered...and watered and waited...and then low-and-behold, I noticed these two little buds beginning to form on the long stem - Eureka!! I was so excited I had to take a photo of this gorgeous new flower that has appeared. I guess patience really is a virtue. I thank Nere for this new bloom of fuchsia that is the focal point now in my kitchen and I think of her every morning when I see it sitting in the sunlight...the little things. Now...I've been intending to sit down every evening for the past two weeks and post a new entry, but the time slips away...warm evenings have caused me to linger a bit too long in my backyard, but it's been worth it. 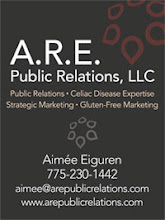 In addition to this blog, as I mentioned last month, I've become an author on Celiac.com's website which is really exciting, but finding the time between working full-time, having a social life and exercising, and researching Celiac news, and ...well, you get the picture. I need like 8 more hours in each day, please!! Receiving emails from newly diagnosed Celiacs has become the main source of the comments left for me to respond to. I'm amazed, though I shouldn't be, at the number of women...yes women vs. men who seem to have struggled for so many years and ultimately diagnosed with this disease. The majority who have written to me range in age from the early 40's - late 60's. My heart truly goes out to these folks who have been struggling for so long with no answers...until now. Now, I hope they can find a way to celebrate, even through the confusion because it does get better, and better and better. Not to say they won't have days of feeling completely overwhelmed with what their "new life" will ask of them, but as I've always said and believed, KNOWING is so much better than not knowing. Knowing, means you can face something head-on, with all of your strength and energy and resolve or learn to manage with ABUNDANCE...whatever it may be. I have emailed back and forth with a woman in southern California who was also recently diagnosed and really struggling with finding safe restaurants to eat at, and with the whole concept of eating out at restaurants period, which can be quite daunting, intimidating and scary. It honestly takes a long time to feel confident walking into a new restaurant you have never visited before and being assertive about what you can and cannot eat as a Celiac, and making sure the server and chef go the message loud and clear. This is especially true when eating out with larger groups of friends, family or colleagues - you must press the issue for your own safety, regardless of how uncomfortable you might feel. Being clear and upfront about what you cannot eat, always beats the dread of two hours later knowing that you were poisoned and dealing with the inevitable 2-3 weeks of feeling "hung over"...at least that's how it is in my case! So, this woman suggested that I begin talking about WHERE Celiacs can safely eat and which restaurants around our country not only are safe, but even promote their own gluten-free menus. I say Bravo! It's a great idea and one that will require much research on my part, but something I am excited and looking forward to doing - great suggestion, my Celiac friend. I have posted several GF restaurants on my blog from my travels and have had great success at these lovely eating establishments; however, it's important to find more "main-stream" places to eat that allow for a safe and enjoyable dining experience...actually, we would all just take the safe part of that sentence! As I research these new restaurants and begin to delve into this new realm of information, I will continuously post my findings both on this blog and on my Celiac.com blog, in order to better-reach those reading and searching for some advice and answers. I will begin though, by listing some chain restaurants found nationwide that have their own gluten-free menus. Even when ordering off of these menus, please, please, please remind your server that your food must be prepared in a safe environment without any cross-contamination. Eat safely. Eat well. Eat with abundance.